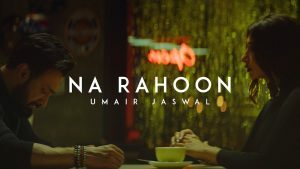 Umair Jaswal has finally released the first song titled ‘Na Rahoon’ from his upcoming self-titled solo album and it was surely something worth the wait. The vocalist powerhouse that along with his band Qayaas got international recognition and who became a regular performer on Coke Studio has gone solo and that is not a bad thing since he manages to bring the house down simply with his powerful voice. The music video directed by Yasir Jaswal gives the impression of a sad love song and the lyrics do translate the expressions of both Umair Jaswal and Hira Tareen into that. But it is really hard to tell what is actually occurring in the music video and it seems like it wasn’t a mistake but it was done on purpose for viewers to interpret the lyrics and video and decide for themselves that what is actually taking place in the video which is quite ingenious on Yasir Jaswal’s part. From the way the music video has been executed, it seems like at first that it would contain a softer voice although when it’s Umair Jaswal you know that’s certainly not the case. His powerful vocals have integrated quite well with a song giving a mixture of something that is new and fresh like something you’re not ready to try at first but then it grows on you and that is exactly the case with Na Rahoon. Another great delight is seeing Faraz Anwar with the guitar who unleashes his own magic in the song merging it with the feel of the song while at the same time remaining true to his signature sound. Ehtesham Ansari, Sajid Mehmood and Toni and Guy have done a wonderful job with the makeup, Sarmad Ghafoor has done amazing work with the mixing and mastering as well as on the song writing process and music along with Umair Jaswal, Faraz Anwar, Isa Najam, Yousuf Ramay, Ali Suhail and Zain Peerzada. Yasir Jaswal has done an amazing job with the direction of the music video whereas Farhan Hafeez has done marvelous work as far as the cinematography is concerned. Eyad Ibrahim served as production head and Waqas Gill was the line producer who managed to perform their roles well as well. 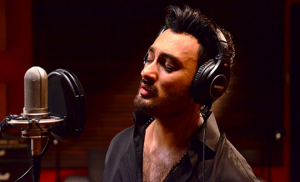 With Na Rahoon, Umair Jaswal is off to a strong start with his upcoming self titled album. This song is not something only Umair Jaswal fans will strictly enjoy but is a treat for everyone and a good way for people to get introduced to his music and then later on transform into his fans. With the first song making a firm mark, only time will tell what the musician has in store for us next.